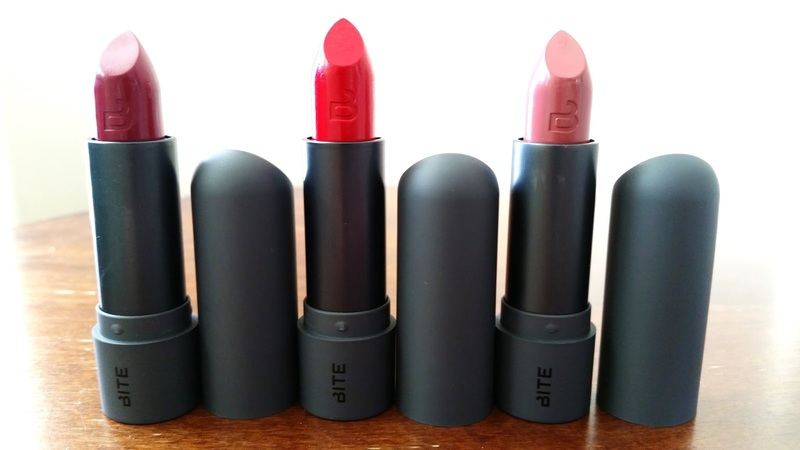 Early this year Bite Beauty released their Amuse Bouche Lipstick line. The line includes 34 bold shades, each crafted by hand. 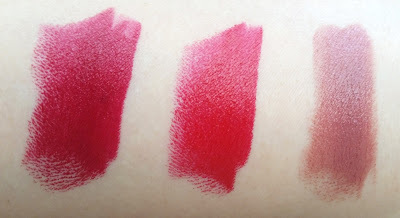 Today, I am going to review 3 of the shades and share swatches as well. The 3 shades I have are Beetroot, Gazpacho, and Pepper. Let's get to know them! Left to right: Beetroot, Gazpacho, and Pepper. Product Description: Beautiful, handcrafted lipsticks that are moisturizing, creamy, and easy to apply. The Bite Beauty Amuse Bouche collection have high-impact lipsticks that have dimensional shades and provide bold colors. 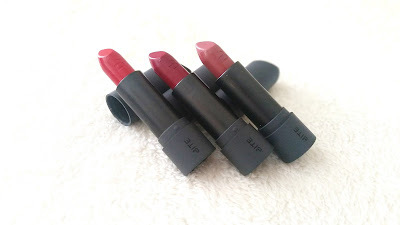 The lipsticks are created in small batches through low-heat processes that preserves a balance of lip-quenching nutrients, vitamins, and omega oils. Together, these qualities keep the lips moisturized and nourished. 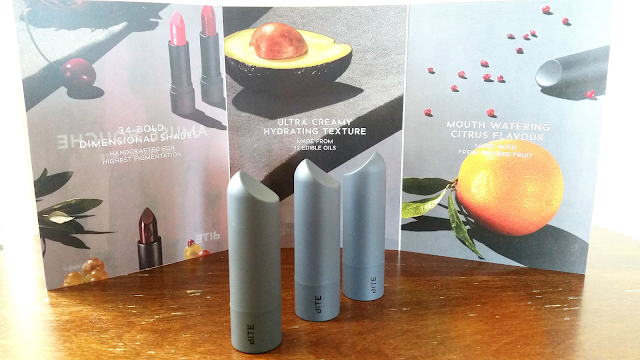 These lipsticks are made with 12 edible oils and triple milled pigments. They provide saturated lip colors with weightless coverage and a citrus flavor that's made from fresh pressed fruit. 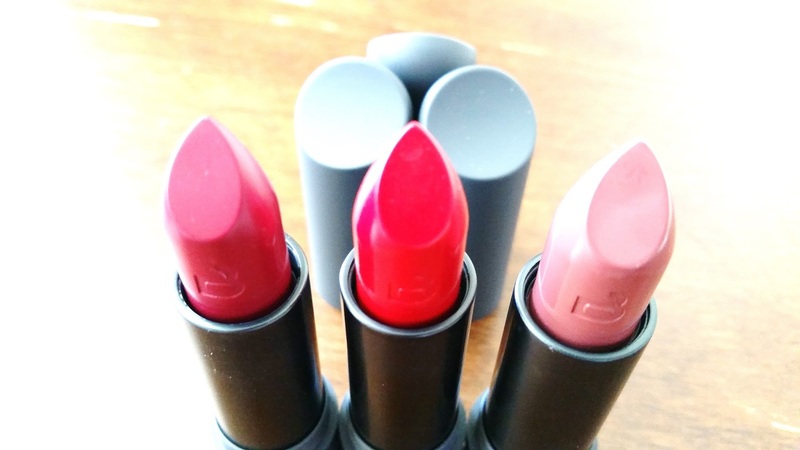 These lipsticks are free of Parabens, Sulfates, and Phthalates. To Use: Make sure the lips are smooth before applying. Prime and line the lips, then apply a layer of Amuse Bouche lipstick. Ingredients: Ricinus Communis (Castor) Seed Oil**, Glyceryl Rosinate*, Cera Alba (Beeswax)**, Simmondsia Chinensis (Jojoba) Seed Oil**, Butyrospermum Parkii (Shea) Butter**, Triisostearyl Citrate*, Argania Spinosa (Argan) Kernel Oil**, Euphorbia Cerifera (Candelilla) Wax*, Hydrogenated Vegetable Oil*, Sesamum Indicum (Sesame) Seed Oil**, Copernicia Cerifera (Carnauba) Wax**, Simmondsia Chinensis (Jojoba) Cera (Wax)*, Polymethyl Methacrylate, Hydrogenated Castor Oil*, Flavor (Aroma), Helianthus Annuus (Sunflower) Seed Wax*, Acacia Decurrens Flower Wax*, Polyglyceryin-3*, Helianthus Annuus (Sunflower) Seed Oil**, Vitis Vinifera (Grape) Seed Extract**, Silk Powder*, Pearl Powder*, Glyceryl Oleate*, Olea Europaea (Olive) Oil Unsaponifiables*, Trans-Resveratrol*, Vitis Vinifera (Grape) Seed Oil**, Almond (Prunus Dulcis) Oil**, Olea Europaea (Olive) Fruit Oil**, Cocos Nucifera (Coconut) Oil**, Persea Gratissima (Avocado) Oil**, Prunus Armeniaca (Apricot) Kernel Oil**, Punica Granatum (Pomegranate) Seed Oil**, Siraitia Grosvenorii (Monk Fruit) Extract*. +/- May Contain: Titanium Dioxide (CI 77891)*, Iron Oxides (CI 77491, CI 77492, CI 77499)*, Carmine (CI 75470)*, Blue 1 Lake (CI 42090), Yellow 5 Lake (CI 19140), Yellow 6 Lake (CI 15985), Red 40 Lake (CI 16035), Red 6 Lake (CI 15850), Red 7 Lake (CI 15850), Red 27 Lake (CI 45410), Red 28 Lake (CI 45410), Red 30 Lake (CI 73360), Red 33 Lake (CI 17200), Manganese Violet (CI 77742)*. All 3 lipsticks contains Resveratrol (5mg each). Resveratrol acts as an antioxidant. Packaging: Sleek and sophisticated, the packaging looks beautiful. It's simple yet the lid adds a playful touch. The tubes have this soft, matte gray-black shade. It makes the colors of the lipsticks pop. The lipsticks are stored in a twist-up tube. They have the Bite Beauty symbol carved on them. The bottom of the tubes have the names of the lipstick and other information. Scent: These lipsticks have this citrus scent due to the fresh pressed fruit flavor added to them. They smell amazing and I really like it. Color: The 3 colors I have are Beetroot, Gazpacho, and Pepper. Beetroot is this beautiful bold berry color. Gazpacho is a true blue-red color and it's stunning. Pepper is a gorgeous dusty rose color that I really like. Texture: The lipsticks have this soft and creamy texture. They are easy to apply and they glide on the lips without tugging at it. Left to right swatches under natural lighting: Beetroot, Gazpacho, and Pepper. Michelle's Thoughts: These are my first Bite Beauty lipsticks and I'm pretty pleased with them. The 3 colors I have are Beetroot, Gazpacho and Pepper. Surprisingly, I like all 3 colors. I know I love Pepper the most, Gazpacho is my second favorite out of the 3 and Beetroot last. I love Pepper the most because it's a color I can wear daily. Plus I've been loving the dusty rose color since fall and it just looks so pretty. Gazpacho came second because, well, who can say no to red lipsticks? The blue-red is bold and beautiful. If I apply it with a lip brush, I can get an opaque blue-red out of it that looks great for the day. Beetroot came last but it doesn't mean I don't like it. It's just a color that I won't really wear daily but still likes. The bold berry color is gorgeous but it's not something I would personally pick first. All 3 of these lipsticks are pigmented. They have a sheen when you first apply them, however, if you choose to blot a bit they will turn matte. The packaging is beautiful and I love the lipsticks' citrus scents. Although I've noticed that the citrus scents aren't evenly distributed. My Gazpacho smells more citrusy than the other 2. I can hardly pick up that chemical lipstick smell in my Gazpacho lipstick but since the citrus scent in Pepper and Beetroot is lighter, I can pick up that lipstick scent in those 2. I imagine this is due to the fact that these lipsticks are handmade so each batch will be slightly different than the next. All 3 of these lipsticks are creamy and they apply on easily. However, while they are a bit moisturizing, they aren't super moisturizing. So don't expect these lipsticks to act like a moisturizing lip balm. Also, if you have dry lips, the creamy lipstick can settle into the lines and dryness, so make sure to moisturize your lips first. These lipsticks aren't super long lasting either. Without eating or drinking, I can go about 4 to 5 hours before I need to touch up. However, if I eat or drink, I would need to touch up sooner. Final Thoughts: Bite Beauty has left a good first impression with these Amuse Bouche Lipsticks. I am especially fond of the color Pepper and can see myself wearing it often. These lipsticks do have some drawbacks, but overall they are pretty great. Would I purchase these in the future? I have my eye on a couple of different colors from this line, so I'll probably pick them up sometime. Do I think these are worth a try? Yes! Stop by Sephora, give them a swatch and take a whiff. There are 34 colors to choose from, so there's bond to be something for everyone.